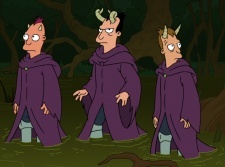 Waltazar, Larius and Ignus are three demon versions of brothers Walt, Larry and Igner. They live in Cornwood with their mother Momon. He is a demon version of Mom's oldest son, Walt; he is the leader of the three. He is usually the first to get angry at his siblings and slap them, he also has the largest horns because he is the eldest of the three. He is a demon version of Mom's middle son, Larry; he is the second-in-command. He is relatively competent and is usually the one to stick up for his younger brother Ignus, however at the same time be the one to slap him the most. He is a demon version of the youngest of Mom's sons, Igner; he is highly incompetent but is apparently skilled at duelling. He overheard Momon telling his brothers a terrible secret about him, and later tried to help the Fellowship to defeat her, but failed, when he aggravated Greyfarn by calling a magic arachnid a magic bug. The two had a duel which ended when Ignus revealed that he is Greyfarn's son. He also has the shortest horns. They are a parody of The Black Riders, or Nazgûl. They are also obviously based on Mom's sons, Walt, Larry, and Igner. This page was last edited on 22 December 2014, at 11:00.